White's fourth album finds her playing bolder music with a daring conceit, but the results are decidedly mixed. Songwriting is rarely an effortless venture. That seems like a blatantly obvious statement -- of course songwriters put time and effort into the very thing that gives them their title -- but it’s not something that many listeners think of. Inevitably, the average person isn’t going to think of the process when all they have is the finished product to consider. For some artists, though, the process is key to considering the end result, both in terms of context and as an extension of the album’s themes. 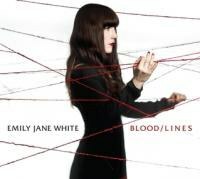 It’s that process that is key for Emily Jane White on Blood/Lines, an album that becomes all the more fascinating when you consider how its core conflicts came to be. Since her career started, White has relied on a sweeping, dramatic sound, and her work has only gotten more grandiose as she’s progressed. White’s development as an artist mirrors that of PJ Harvey in many ways, and Harvey stands out as one of White’s key influences. Blood/Lines ends up being a culmination of sorts for White, as it finds her settling into a very comfortable creative groove. Her fourth album in as many years, Blood/Lines does demonstrate White’s remarkably rapid artistic growth. Here, she moves further and further away from the spare, guitar-driven moodiness that she’s done well so far (and that the likes of Scout Niblett continue to do) and towards a more sprawling, sweeping sound using an interesting method: the album’s nine songs were mended together from sketches instead of being written as full pieces. For the most part, it works. “Faster Than the Devil” stands out as an example of everything that goes right on Blood/Lines. It’s a brooding number that reaches a sort of grandiosity, anchored by White’s powerful voice and eerie backing vocals supplied by Marissa Nadler. Even stronger is “Keely”, where White’s vocals, backed by an evocative set of synth-strings, hit a peak of tenderness that becomes a high point for the album. At times, Blood/Lines falls a bit flat. White does herself no favors by opening with “My Beloved”, a decent song that nonetheless feels like a retread as one explores the album further. As a whole, though, the album suffers from something that isn’t apparent on first listen: many of these songs, as beautiful as they are, fail to really land emotionally. Some would place the fault on White’s unconventional songwriting process for the album, and while Blood/Lines doesn’t sound like a patch job, the cracks do start to show on repeated listens. These aren’t the sort of things that ruin the album outright. A weak transition or a throwaway lyric doesn’t make a song absolutely worthless, nor does stretching a piece of music for a minute or two past its logical endpoint. Still, these little things keep White from realizing her full potential here. Though it may be a missed opportunity at times, Blood/Lines still represents a crucial step in White’s development as an artist. Far from being the PJ Harvey/Kate Bush knockoff that she was unfairly pigeonholed as early in her career, White has found a unique trail to blaze, and there’s plenty about Blood/Lines that demonstrates just how great she can be. However, should she create the masterpiece that she has in her, it’ll be hard to look back on this album as little more than a missed opportunity.